There are several construction projects happening on the University of Wisconsin-Stout campus. Michael Bowman, Project Manager at UW-Stout, was able to give insight and information on the status of the ongoing construction projects. 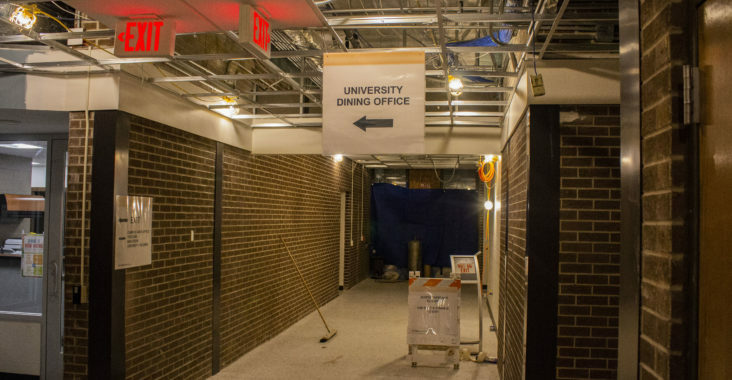 The Price Commons’ first floor remodel is one of the current projects happening on campus. 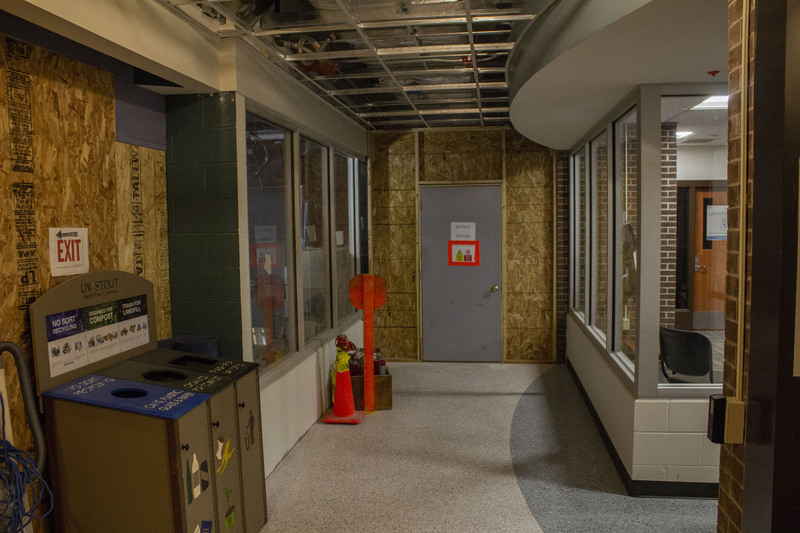 The east half of the first floor was reoccupied over winter break by the Housing staff, the Card Office, Student Life Services and Dining staff. New windows were installed. The new east entrance to the building is still in progress and currently being used. Contractors have now taken over the west half of the building and are currently working on demolition of the old glass lounge. New meetings room and lounge spaces will be created on the west half. Major mechanical and electrical systems in the building continue to be replaced. More exterior work will take place including new north and south entrances, more work on the patio on the west side, new sidewalk additions and planting grass and landscaping come this summer. The project is projected to carry on through the summer of 2019. The North Hall dorm renovation is another project happening on campus. Demolition is complete, and three new additions have been built and continue to be worked on. New metal panel exterior as well as new glass continues being installed. All new windows around the dorm were placed in the fall. Work on mechanical and electrical systems work are being done on the inside. Currently, drywall, floor, wall ceramic tile and painting are being worked on throughout the building. There will soon be lighting, HVAC units, data infrastructure, carpet and cabinetry. Exterior works will continue through the winter, but major exterior work will pick up this summer. Exterior work such as new asphalt paving, concrete sidewalks, the main entry on the east side of the building, retaining walls, grass planting and landscaping will take place this summer. Work is scheduled to carry on through most of summer 2019. The Bowman Hall exterior restoration is also a current project taking place on campus. Most exterior work has stopped through the winter as masonry work cannot be completed in cold temperatures. Exterior work will likely commence in March, depending on weather, and carry on through Fall of 2019. The south side exterior of the building has received a significant amount of replacement brick, replacement stone, painting on the dormers and gutters and new mortar in horizontal joints on the south side. Exterior work will be done on the east, north and west sides of the building. Major work on the clock tower will begin this spring. All the exterior windows have been replaced with windows that replicated the original 1898 ones. The remainder of the building will be getting all new windows to replicate the original. Updates have been made to wall finishes, ceiling finishes, lighting and a portion of the original steel girders have been exposed as well as some original interior brick work that had been covered up by plaster for the past 100 years. There have been numerous smaller projects completed in the past six months as well. These include the new Fab Lab space in Vocational Rehabilitation room 120, the renovation of the old foundry in Applied Arts room 109 to create a new plaster lab, rebuilding and adding onto the climbing wall in the Sports and Fitness Center and many other projects. The next major project that UW-Stout will be undertaking in the immediate future will be the renovation of the Nelson Soccer Field. This field will be torn out and underground utility work will be completed to help. A new artificial turf will also be put down. This project is currently in the design phase and is awaiting some approvals at the state level before beginning. UW-Stout is hoping for a summer 2019 construction start. Each year UW-Stout also tackles approximately 30-40 lab mod projects that update and improve classroom and lab spaces. The internal crews are already booked throughout summer 2019 with projects.